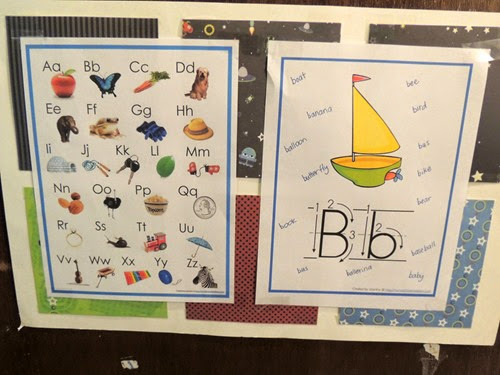 For our second week learning a weekly letter, our Letter of the Week was of course the letter B. Simon wasn’t quite ready to retire our Letter A poster, so we moved it to the spot above the main poster on the door. I think we will leave the letters up for a few weeks until it is time for a review week. We had a lot of words to focus on this week as there are lots of great B words! The words that I wrote on the poster are boat, banana, balloon, butterfly, book, bus, bee, bird, bike, bear, baseball, baby, and ballerina. I used all of these words because they were either featured on the worksheets we were using or they had special meaning – like learning about baseball during the week of the World Series. 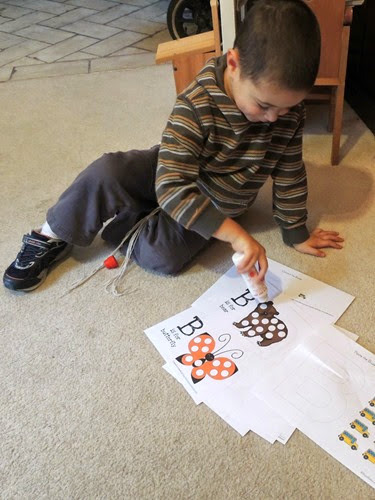 Simon claimed that he did not like butterflies, so he chose to only do-a-dot on the bear on this page from homeschoolcreations.com. 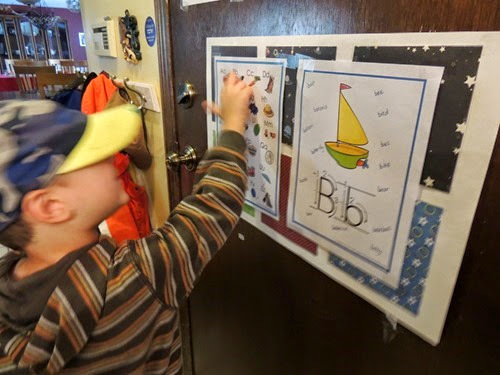 He worked on coloring the B is for Baby page and the Alphabet Cut and Paste sheet from the same source. He chose not to color the Butterfly B from education.com, nor did he complete the bus pages from the Zoomin Moving Alphabet Curriculum. Learning from my mistakes, I plan to present him with less options at one time and hope he focuses better on the options I give him! I really wanted to read Simon the Berenstain Bear’s B Book this week but although I know we own it, I couldn’t find it in the house! He did enjoy our reading of the Sesame Street A & B book from the series of books I grew up with! This week we are moving on to the Letter C!